Ben Roethlisberger is practicing with the Pittsburgh Steelers, one week to the day since he learned he wouldn't be charged for sexual assault. The Steelers began voluntary on-field practices Monday. 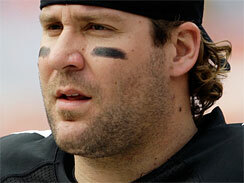 Roethlisberger also participated in off-the-field conditioning work for several days last week. The quarterback is awaiting word on possible disciplinary action by the NFL, even though prosecutors in Georgia declined to bring charges after a college student accused him of sexual assault in March. He also is being sued by a different woman who says he raped her in 2008 at a Lake Tahoe hotel-casino. Roethlisberger denies the accusation and was not criminally charged in that case. He has claimed counter-damages in a lawsuit. Team president Art Rooney II says the Steelers were ready to punish the quarterback, but declined to do so because such action could be contested by the players' union. The Steelers say Roethlisberger is not expected to comment Monday. NFL commissioner Roger Goodell could fine and/or suspend Roethlisberger under the league's personal conduct policy. But NFL spokesman Greg Aiello says no time has been set on a decision.